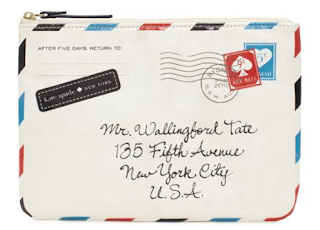 How cute is this Kate Spade pouch? It's been a long time since I've heard the AOL tune "you've got mail" (oh middle school chat room memories), but I certainly wouldn't mind receiving this baby from the postman. Ohh my god so cute!! Oh I love it. Love the "old school" touch. That really is pretty darn awesome! Are we talking postman or Pooosstmaaan ;) ;) lol! So cute! I just can't get enough of Kate Spade! So super cute. I'm loving everything kate spade right now.